Basic constructions. Algebras: associative and Lie. Linear Lie algebras. Structure constants. Lie algebras from p-groups. On algorithms. Centralizers and normalizers. Chains of ideals. Morphisms of Lie algebras. Derivations. (Semi)direct sums. Automorphisms of Lie algebras. Representations of Lie algebras. Restricted Lie algebras. Extension of the ground field. Finding a direct sum decomposition. Notes. On nilpotency and solvability. Engel's theorem. The nilradical. The solvable radical. Lie's theorems. A criterion for solvability. A characterization of the solvable radical. Finding a non-nilpotent element. Notes. Cartan subalgebras. Primary decompositions. Cartan subalgebras. The root space decomposition. Polynomial functions. Conjugacy of Cartan subalgebras. Conjugacy of Cartan subalgebras of solvable Lie algebras. Calculating the nilradical. Notes. Lie algebras with non-degenerate Killing form. Trace forms and the Killing form. Semisimple Lie algebras. Direct sum decomposition. Complete reducibility of representations. All derivations are inner. The Jordan decomposition. Levi's theorem. Existence of a Cartan subalgebra. Facts on roots. Some proofs for modular fields. Splitting and decomposing elements. Direct sum decomposition. Computing a Levi subalgebra. A structure theorem of Cartan subalgebras. Using Cartan subalgebras to compute Levi subalgebras. Notes. The classification of the simple Lie algebras. Representations of the sl2(F). Some more root facts. Root systems. Root systems of rank two. Simple systems. Cartan matrices. Simple systems and the Weyl group. Dynkin diagrams. Classifying Dynkin diagrams. Constructing the root systems. Constructing isomorphisms. Constructing the semisimple Lie algebras. The simply-laced case. Diagram automorphisms. The non simply-laced case. The classification theorem. Recognizing a semisimple Lie algebra. Identifying a semisimple Lie algebra. Isomorphism of semisimple Lie algebras. Notes. Universal enveloping algebras. Ideals in free associative algebras. Universal enveloping algebras. Gröbner bases in universal enveloping algebras. Gröbner bases of left ideals. Contructing a representation of a Lie algebra of characteristic 0. Calculating a series of extensions. The extension space. Extending a representation. Ado's theorem. The theorem of Iwasawa. Notes. Finitely presented Lie algebras. Free Lie algebras. Finitely presented Lie algebras. Gröbner bases in free algebras. Contructing a basis of a finitely presented Lie algebra. Hall sets. Standard sequences. A Hall set provides a basis. Two examples of Hall orders. Reduction in L(X). Gröbner bases in free Lie algebras. Presentations of the simple Lie algebras of characteristic zero. Notes. Representations of semisimple Lie algebras. The weights of a representation. Verma modules. Integral functions and the Weyl group. Finite dimensionality. On representing the weights. Computing orbits of the Weyl group. Calculating the weights. The multiplicity formula of Freudenthal. Modifying Freudenthal's formula. Weyl's formulas. The formulas of Kostant and Racah. Decomposing a tensor product. Branching rules. Notes. On associative algebras. Radical and semisimplicity. Algebras generated by a single element. Central idempotents. Notes. Bibliography. Index of Symbols. Index of Terminology. 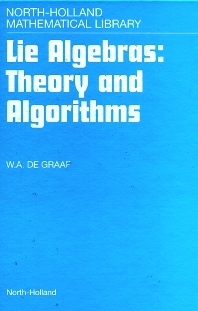 Index of Algorithms. The aim of the present work is two-fold. Firstly it aims at a giving an account of many existing algorithms for calculating with finite-dimensional Lie algebras. Secondly, the book provides an introduction into the theory of finite-dimensional Lie algebras. These two subject areas are intimately related. First of all, the algorithmic perspective often invites a different approach to the theoretical material than the one taken in various other monographs (e.g., , , , ). Indeed, on various occasions the knowledge of certain algorithms allows us to obtain a straightforward proof of theoretical results (we mention the proof of the Poincaré-Birkhoff-Witt theorem and the proof of Iwasawa's theorem as examples). Also proofs that contain algorithmic constructions are explicitly formulated as algorithms (an example is the isomorphism theorem for semisimple Lie algebras that constructs an isomorphism in case it exists). Secondly, the algorithms can be used to arrive at a better understanding of the theory. Performing the algorithms in concrete examples, calculating with the concepts involved, really brings the theory of life.